Hebenstreit Gmbh have been serving world bakery industry for long . 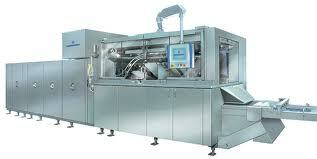 It has installation across the globe and bakery equipments have been installed in numerous bakeries in world . Hebenstreit GmbH has 100 years of history for bakery equipment s . It has dominant market share for hollow and flat wafer biscuit equipments . Hebenstreit have been pioneer in bakery technologies its manufacturing expertise and services had made them world leader in wafers bakery equipments .World over manufacturers prefer Hebenstreit wafer manufacturing technology . Founded in 1898 in Radebeul near Dresden, Hebenstreit has been based in Frankfurt am Main since 1950, and since 1978 in Moerfelden-Walldorf. Hebenstreit takes complete project from design to commissioning stage from customer . through their Aftermarket services from Germany based centre . Hebenstreit provides excellent support in terms of spares for their equipments such as spares for wafer ovens , creaming and cutting block , service contracts . It has service partners in Asia , Europe , Africa ,America and Australia.